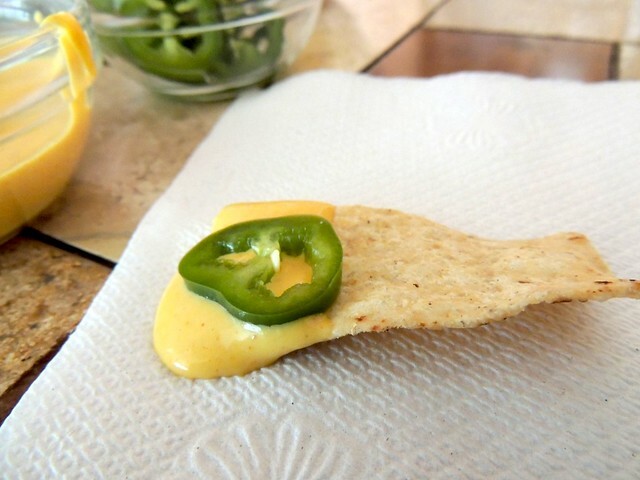 My friend sent me this recipe and asked me to test it out, knowing I am in love with nacho sauce (usually of the Velveeta variety). 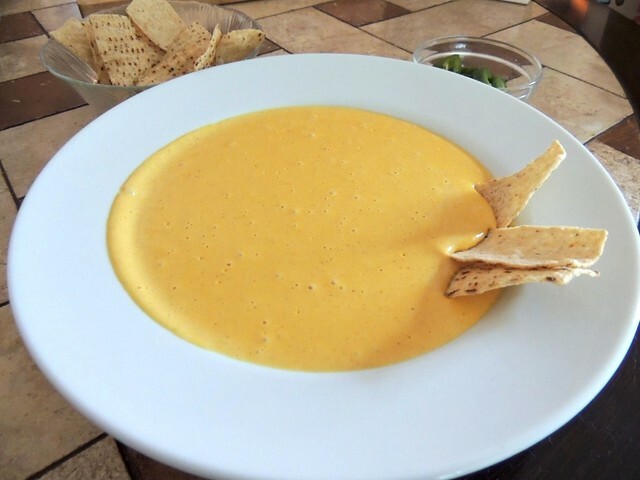 I'm semi-familiar with the Serious Eats version, which uses cheddar, and wondered how the flavor of this recipe would compare. Would compare in theory, since I've never tried either, and although I wasn't sure what I would do with 2 cups of nacho sauce, I finally got all the ingredients together to find out if it's a worthy substitute for my beloved chemically-infused nacho cheese sauce from a can/block of processed cheese-like matter. Actually, I didn't have all the ingredients. 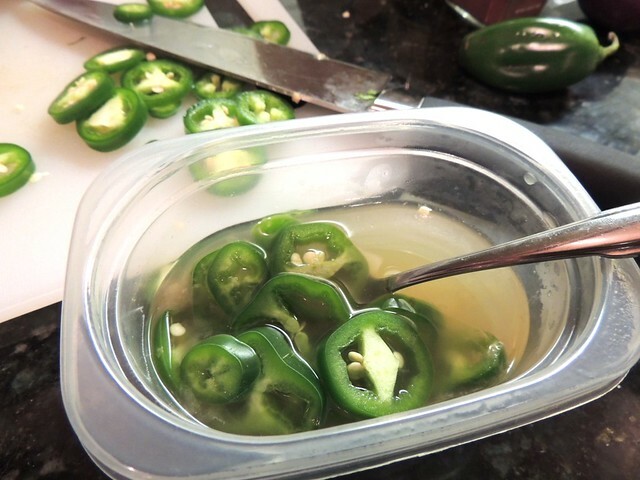 I forgot my immersion blender and a few other things, so the jalapenos ended up pickling for a few days before I got around to the sauce. I almost wasn't going to make these, because despite being half Mexican my tolerance for heat is pitiful. Yet, I did, as I was excited by the idea of pickling something. 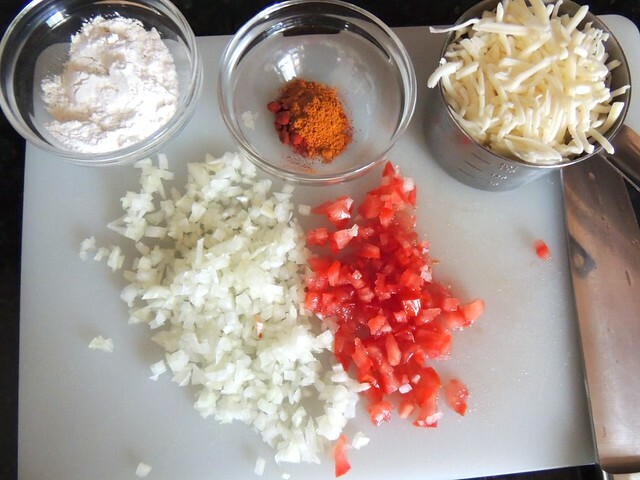 Since this recipe uses a mild monterey jack cheese, which the author found to melt better than cheddar, the majority of the flavor comes from the spice mixture (paprika and cayenne pepper), onions, tomatoes, and buttermilk. Even though the paprika and cayenne pepper help flavor and color the otherwise pale sauce, tumeric is added to further enhance the color. I didn't have buttermilk and didn't feel like buying a container for just this recipe, so I soured my own milk my heating up one cup minus two tablespoons milk and stirring in two tablespoons of white vinegar. It seemed to work fine. My other issue was determining just how much 2 ounces of cheese really was, as I knew it couldn't be a mere 1/4 cup. Just no way. I finally determined it was around 2/3 cup, so I used 1 cup. I figured this wouldn't really be a problem, it would just create a somewhat thicker sauce and maybe give it more flavor. 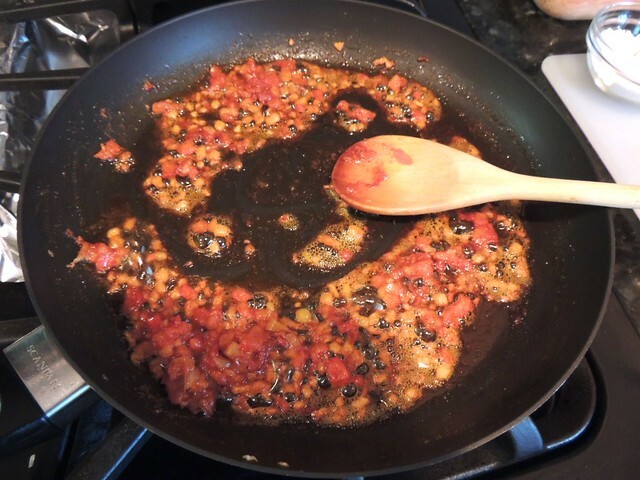 The onions and tomatoes are sauteed with the spices until the onions softened. There was supposed to be a green chile in there, but since the cayenne pepper adds heat and I was planning to eat the jalapenos, I didn't want to go overboard. 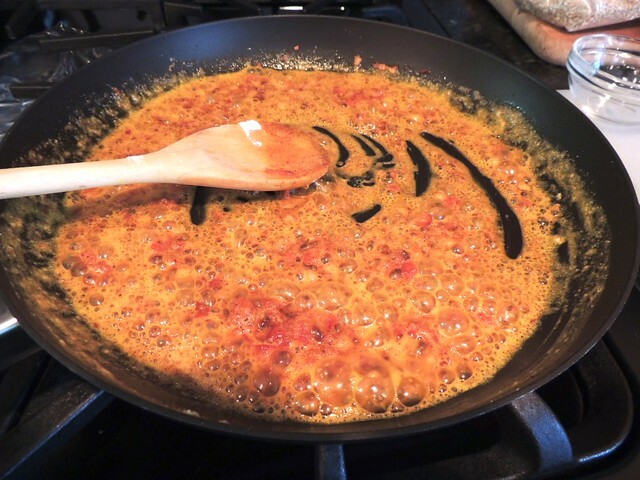 After the onions have softened, flour is added to create a roux for the sauce. At this point, the heavy cream, half the buttermilk, and the cheese is added. 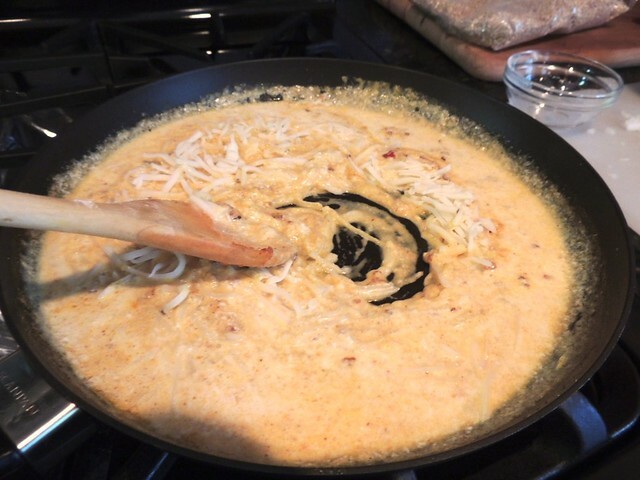 You gotta stir continuously, even when it looks like the cheese remains clumpy and won't melt into the sauce. The remaining buttermilk is added and stirred in slowly. 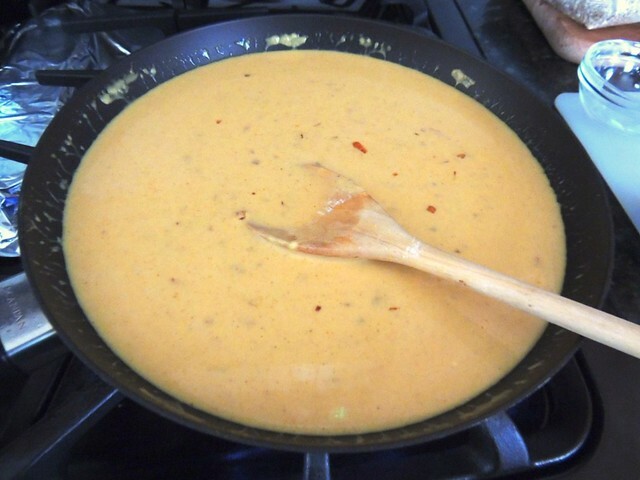 After adding all the buttermilk, my sauce still wasn't completely smooth, so I raised the heat a little and stirred. Finally, the cheese melted and turned into a sauce! The directions say to then blend the sauce. This required me to transfer the sauce to my immersion blender cup to blend until completely smooth. While doing all that, I kept coming up with reasons why this wasn't a necessary step, but finally realized it was. 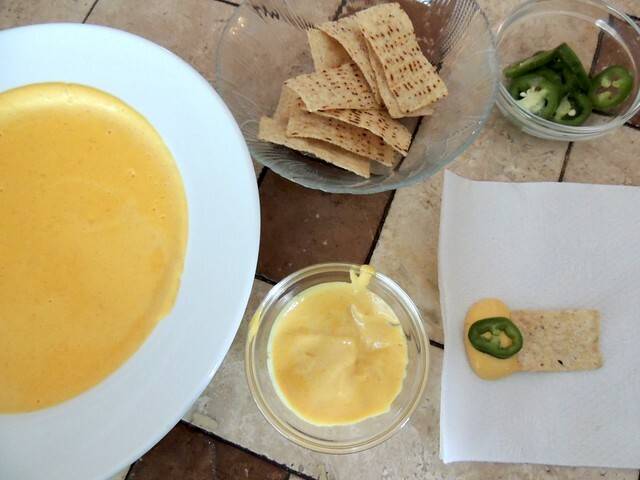 Not only does the sauce take on the texture of awesome nacho cheese sauce, the final step requires streaming in a little olive oil while blending to further enhance the texture. It's a lot of trouble, though I urge you not to skip it. It's actually a very good dip, though I felt that it lacked that intense cheesiness. Next time, I'll try it with white cheddar. However, the texture was pretty spot on and even though it wasn't the nacho cheese of my youth, that didn't keep me from continuously dipping chips into the luscious sauce. I still have quite a bit left I need to warm up to see how well it reheats. What astounded me is how much I absolutely LOVED the pickled jalapenos, and I think that they really made the sauce. They're also good on pizza, quesadillas, and just by the slice. The texture is much better than store-bought pickled jalapenos, as well as not being quite as spicy. Maybe that was just the particular peppers I used, I don't really know. To sum up, the crucial step was blending the sauce and streaming in olive oil. You could probably get away with skipping the heavy cream, using either more buttermilk or evaporated milk, as long as it's not fat-free. One day in the future, I will try this with a more flavorful cheese, especially since the blending would take care of any cheese that refused to melt. It's a little too much work to satisfy a personal craving though, but I'm glad I tried it. Always glad to pass on a good recipe! Well if anything I need to try to pickle jalapenos! I love them on everything. Do it! My boyfriend didn't try the sauce, but he went on and on about the jalapenos. It's so easy to do! i really wanna try this! wow, so fun. i've never pickled anything!